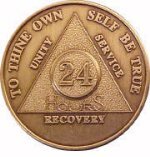 We are especially happy to provide an online, searchable BIG BOOK® of Alcoholics Anonymous®. Our Online BIG BOOK® is used by thousands of people all over the world. Serenityclub.info has neither been approved or endorsed by and is not affiliated with Alcoholics Anonymous® World Services, Inc. or any service entity of A.A.W.S., Inc.